Tucked into the Carpathian Mountains in southwestern Ukraine, Kosmach is the center of the 500,000-strong Greek Catholic and Orthodox Hutsul community. The 13th-century Mongol invasion of Kievan Rus — which includes parts of present-day Belarus, Russia and Ukraine — is an essential chapter in Hutsul history. Many of those who survived the ruthless devastation of their homeland, peasants mostly, headed for the hills, seeking refuge in the Carpathians. The earliest written references identifying these refugees as Hutsuls date to 14th- and early 15th-century Polish documents. The intensification of serfdom, which bound the peasants to the land, provoked another exodus to the mountains hundreds of years later. Today, the descendants of these refugees live in an area covering 2,500 square miles in southwestern Ukraine and northern Romania. 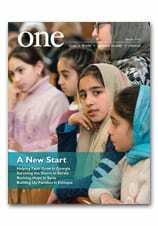 Read more about Faith and Tradition in Ukraine from the November 2004 issue of ONE.